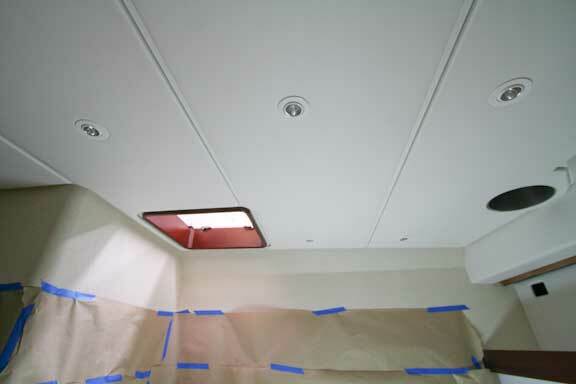 Trying to get a feel for the interior of a boat under construction is difficult. Furniture is covered, lighting is bad, there are no embellishments to give the image a finished look. 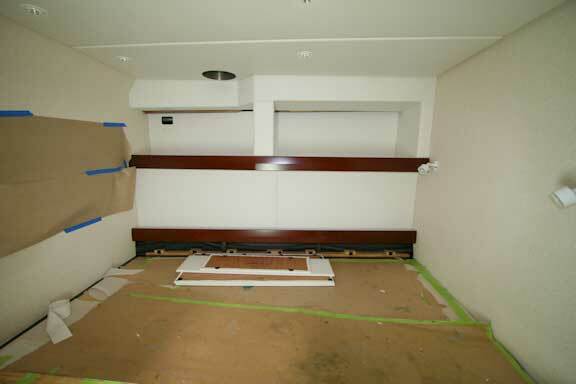 But now that the upholstery is starting to go into the first FPB 64 you will be able to get sense for the space. 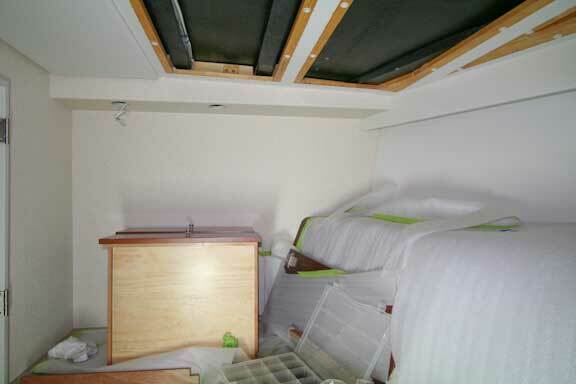 The photo above is taken from the aft end of the port side guest suite. Looking across the bunk here. Once art work is installed on the bulkheads the space will expand substantially. 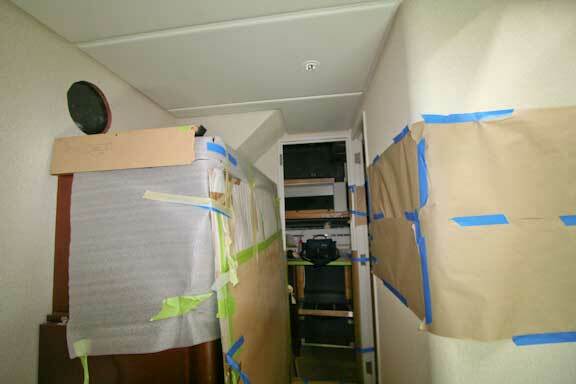 Looking up towards the aft end of the stateroom. 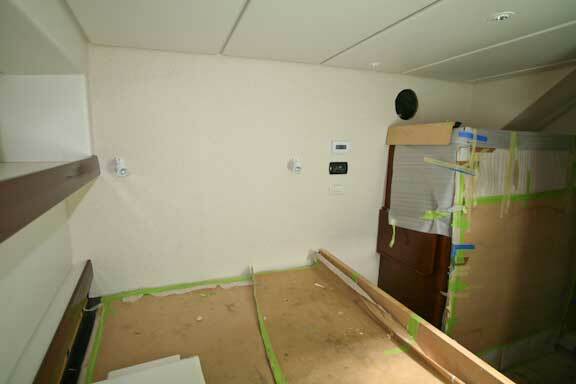 The camera pointing down the entry hallway to the port cabin, from the bunk towards the office area. The forward starboard part of the Owner’ suite. Still in the Owner’s suite above, Circa have done a nice job with a tr icky bit of upholstery. 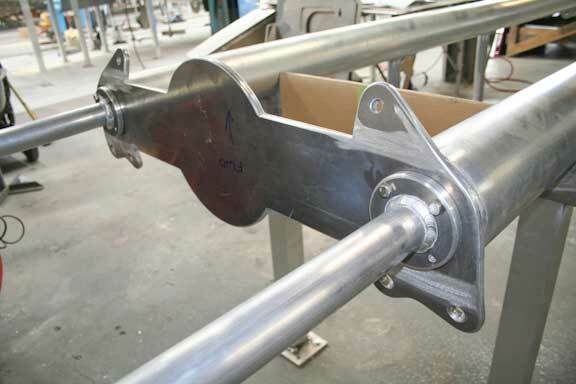 Switch boats now, a few mast details from the second FPB 64. 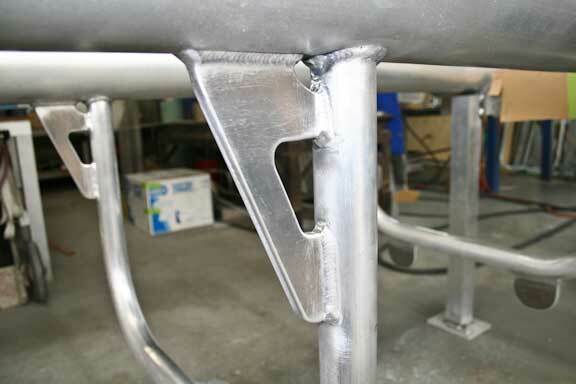 You are looking at the base between the spars, onto which various bits of rigging attach. 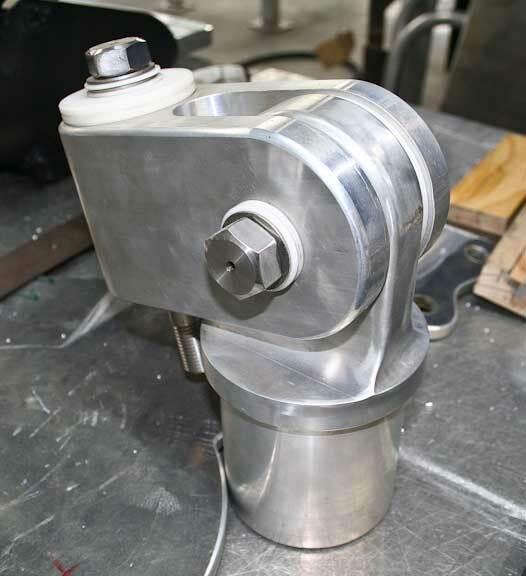 Here is a tricky bit of machining. Can you guess what this is? If you said goose neck assembly for one of the booms you’d be correct. 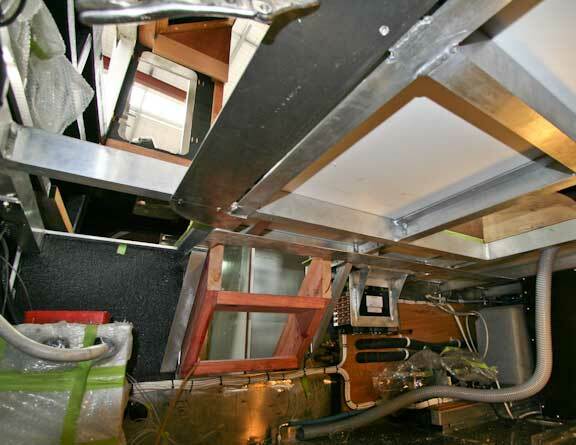 This photo is taken from the middle of the basement looking aft on the second boat. The great room sole is overhead. 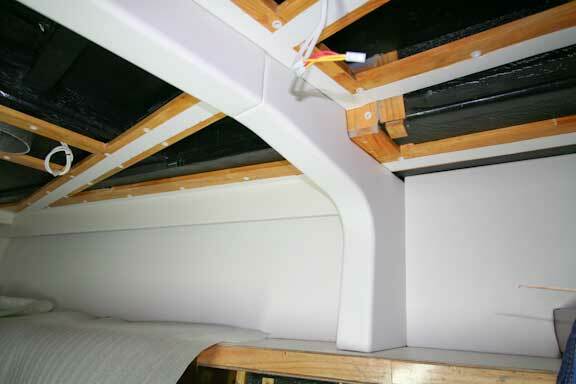 A nice bracket for one of the two heater coils in the great room (still on FPB 64 #2). Switching now to the third FPB 64. Metal work details are nearing completion. 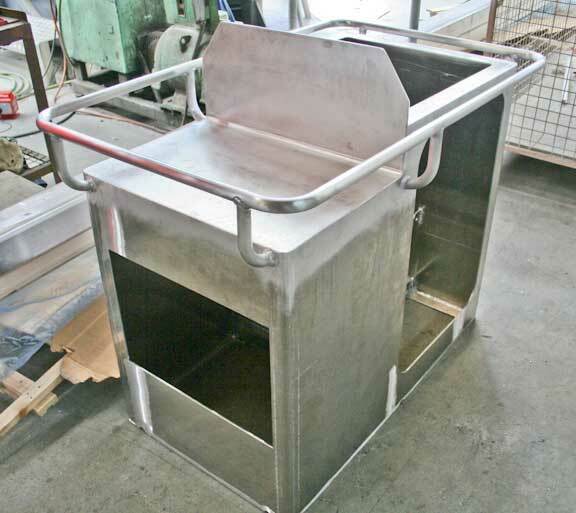 Speaking of details, we want to show you three different views of the combination engine room air intake and Bar BQ table and sink island. 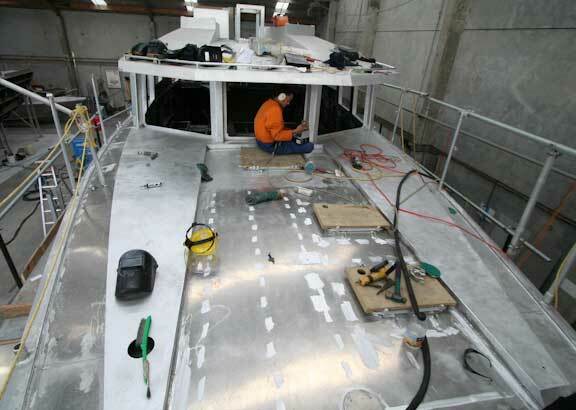 This one is for the third boat and is in the fabrication shop. 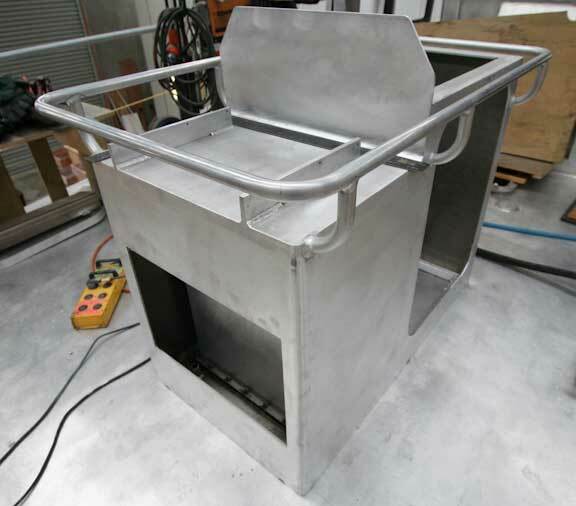 Note the large opening where the water shedding grill will eventually be bolted. 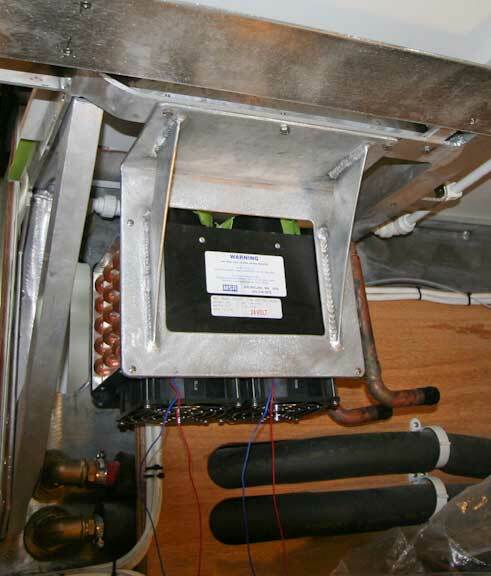 The air intake table unit installed on the second boat. If you look inside the cut out you will see the upstand, into which air flows into the engine room. 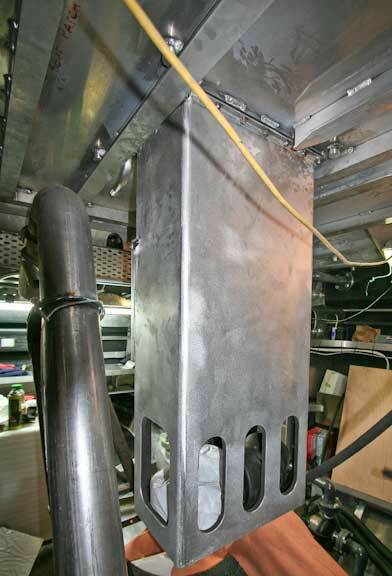 This upstand works like a giant Dorade vent keeping any water that gets past the grill from entering the engine room. Still on FPB 64 #2, the air intake projection into the engine room. The reason it drops so far in is to keep it above the inverted waterline. In other words, if you are upside down the slots are well above the waterline. There is also a dampener plate inside of the down pipe that can be closed with a Morse control cable. This entry was posted on Friday, February 12th, 2010 at 11:22 pm and is filed under FPB 64 Updates. Both comments and pings are currently closed. I’m curious… What’s going on with the changes between #2 and #3 in the handrail supports around the island? Just a slight fine tuning of dimensions.